At age 65, one in three people has hearing loss. It’s the third most common physical condition after arthritis and heart disease. However, only 20% of people who could benefit from hearing treatment actually seek help. Without treatment, hearing loss is associated with a 30 – 40% faster decline in cognitive abilities like memory and concentration. But the high cost of hearing aids doesn’t always fit in an older adult’s budget. When just one hearing aid can cost $2,500 or more, it’s no wonder that seniors are turning to more affordable hearing aid options. These alternative devices are called personal sound amplification products (PSAPs). Hearing amplifiers are much less expensive because they aren’t regulated by the FDA. That means they aren’t required to meet specific technical or performance standards. That also means that some may work better than traditional hearing aids, but others are just a waste of money (like some found in drugstores). Another benefit of PSAPs is they can be purchased by anyone and don’t require referrals, custom molds, or expert fittings like traditional hearing aids would. What Exactly is a Hearing Amplifier? As the name indicates a hearing amplifier enhances sound. It literally magnifies sound. When wearing one, you will find that your hearing experience is greatly enhanced as you can now hear sounds from all frequencies that were previously inaudible. Personal hearing amplifiers are also known as sound amplifiers and you will often find the two terms used interchangeably on the web. They are easy to use, easy to remove, maintain and keep clean. The best ones are completely invisible, so no one need know that you are wearing one. How do Sound Amplifiers Work? The way they work is very similar to a microphone – picking up on surrounding noise and feeding it through to a tiny speaker. However, they have much greater range and are small enough to sit comfortably behind and in the ear. An amplifier does not work in the same way as a medical grade haring aid. It amplifiers all sound and has less calibration options than a hearing aid. Medical grade hearing aids amplify specific frequencies of sound. If you have lost the ability to hear high frequency sounds a medical grade hearing aid can be calibrated to pick up those sounds. An amplifier will enhance sound across the entire spectrum. This means that you will end up hearing background noise as well as what you are trying to listen to. This short YouTube video sums up the key differences between a sound amplifier and a hearing aid. Who are Hearing Amplifiers Suitable for? 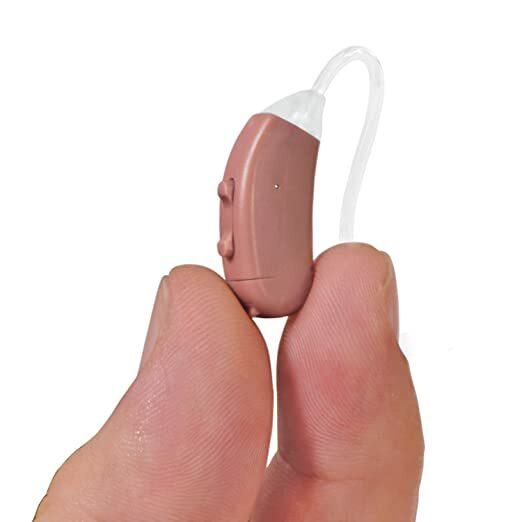 The fact that they pick up the full spectrum of sound means that this kind of hearing aid is not suitable for everyone. They are usually not as powerful as full-blown hearing aids. This means that if you have lost virtually all of your hearing a simple amplifier is not going to help you much. For this reason, we recommend to all of our readers that they speak to their doctor about their hearing loss. It is important to understand what is behind your hearing loss and we recommend getting an audiometric test done. This will help you to determine whether an audio or sound amplifier can help you. Hearing amplifiers are not the same as hearing aids. 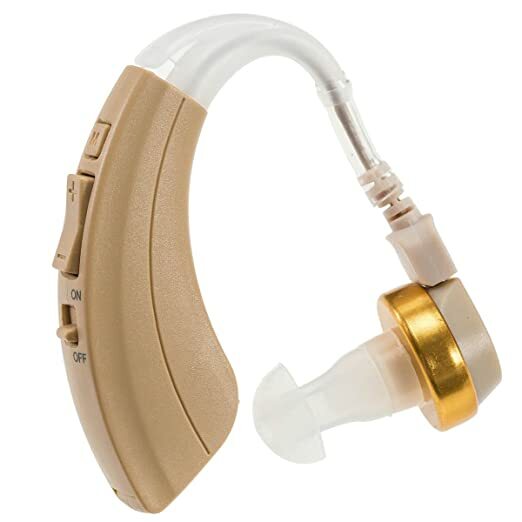 It is very important to understand that they are not medical devices, and you should never buy one from someone who tries to tell you that a hearing amplifier is the same as a hearing aid. However, that said they are helpful devices provided you use them for the right reason and in the right way. People with mild hearing loss can really benefit from using them. Most people use hearing amplifiers for occasional use. Popular uses include going to church or the theater. In this situation there is not a huge amount of background noise, so the fact amplifiers enhance background noise is not an issue. You can hear the sermon or the people on the stage. Many people also use them for watching TV or listening to music. It means that you can turn the TV down to a normal level. This means that you do not have to disturb everyone else in the house when you watch the TV. Using them outdoors can be problematic. For example, you would not want to use one while at a sporting event or on a windy day. The sound of the crowd or the wind is likely to be too intrusive. Some people say they get used to the fact background noises are enhanced and learn to tune this out. It takes a few weeks to learn how to do this, but if you can do so, it may be possible for you to use your amplifier in more places and social situations. People report mixed results when making phone calls. Some experience feedback and cannot hear well, whilst others get on fine when using a landline or mobile phone. If you have any questions at all, we would be glad to answer them. Just drop them in the comments below and a member of the team will get back to you with an answer. 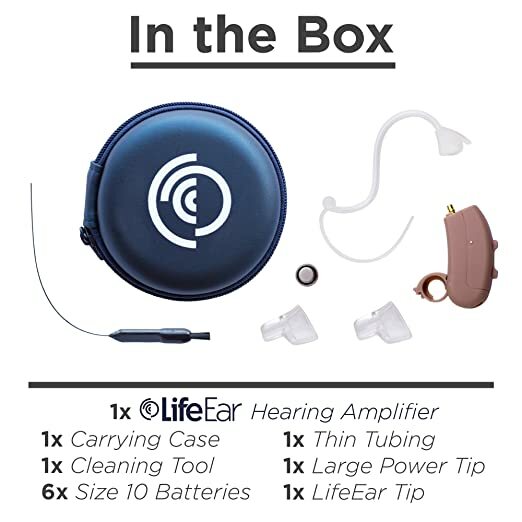 An audiologist designed the LifeEar personal audio amplifier. The LifeEar has 4 volume and noise reduction programs, which helps users to get the most out of the device. It also features 12-band digital sound processing. This hearing amplifier is the most expensive on my list, but the price reflects the quality of the product. 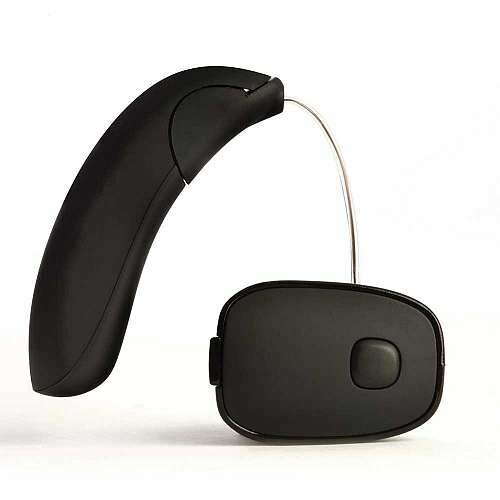 It is designed by an audiologist and is one of the few truly digital hearing amplifiers on the market. You can read the Amazon reviews here. Although this came in a close second behind LifeEar there’s still plenty I like about the Soundworld Solutions CS10 Hearing Amplifier, from its stylish look and feel to its advanced features and customizable app. The customer reviews I read about this product is what first got me interested in this amplifier. It is not particularly cheap, but you get great value for money because it is so feature rich and so well made. See the Amazon reviews here. 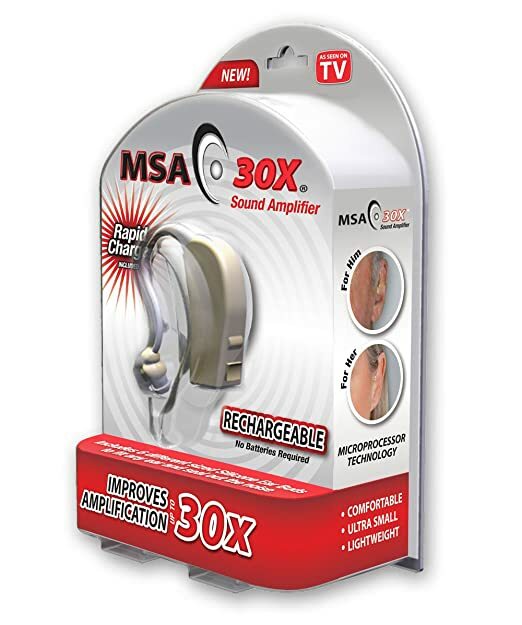 The MSA 30X Sound Amplifier by EasyComforts is not as as feature rich as the first two on my list, however, it is far cheaper. If you are on a tight budget and want to get a better understanding of whether hearing amplifiers are really for you this device is a great way of finding out. You can use it to try one out. It really is cheap enough to allow you to do this. However, don’t expect miracles with this device. The customer reviews for this device were somewhat mixed. Some people absolutely loved the device. Around 40% of people gave the device four or five stars. Many of these people were quite content with the aid and found it met their needs and commented that it exceeded their expectation. Others found it did not help them much because of all the background noise. It is on primarily because of the price, because if your looking for something cheap for occasional use then it may do you just fine.